Ever since we got Gary I’ve been going on a spiral of research trying to learn more about Chinchillas, where they come from and what their natural habitat is like. I thought some of you might be interested, so here are some of the coolest facts I’ve learned! Chinchillas have been taken all around the world, and while they originated from the South American Andes Mountains they are primarily found in Chile and Peru now. They were found in Bolivia for some time, however, that’s a lot less common now. Since they’re mountain creatures they’re actually found at about 15,000 ft. Similar to many other small mammals, Chinchillas do most of their eating and adventuring at night. Their preferred time to move is between dusk and dawn. They spend the majority of their days sleeping. So don’t be afraid if you notice your Chinchilla not eating during the day, even though they’re awake. They’re probably saving the food for later in the day. Chinchillas absolutely hate being alone and always live with others in the wild. Their colonies usually have over 100 other Chinchillas in them. This means if you’re going to adopt one, you may have to consider adopting another or as we do, you must take the time to socialize and play with your Chinchilla! Evolution is such an interesting topic, especially as we study the small changes that happen in various animal’s bodies to cope with the environment they live in. For Chinchinchillas one of the main evolutionary traits is the fact that their blood has thickened over time. Chinchillas actually have more red blood cells than most creatures so they can carry more oxygen to be able to survive the high altitudes they live in. What’s one of the first thing you think of when you hear the word “Chinchilla”. It’s probably coats, jackets or fur. 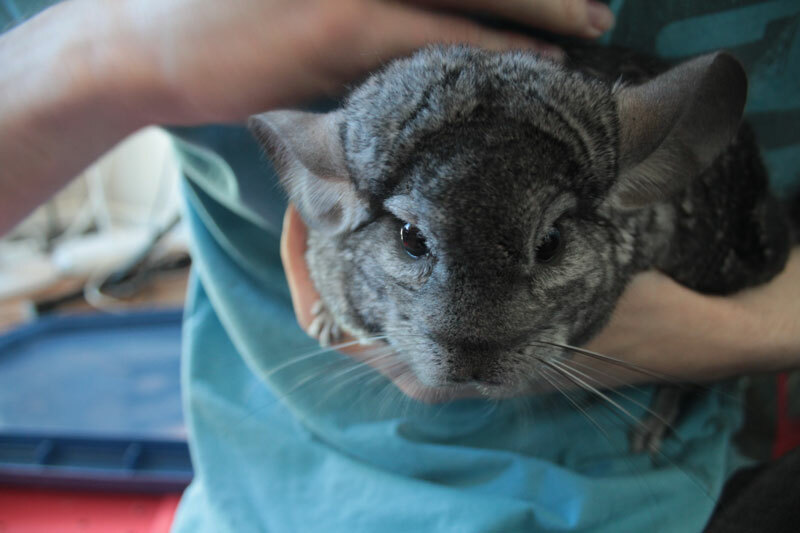 I’ve already let you know the importance of making sure your Chinchilla’s coat is clean so it remains soft, but did you know that over time Chinchilla’s fur has actually gotten thicker? Again, this is due to the fact that they live at such high altitudes. Their home is very cold, has been a huge factor in how they have evolved over the years. Fun Fact – Chinchillas were actually named after the Chincha people who lived in the Andes. This was because the Chincha people commonly used Chinchilla fur to make coats to keep them warm. That being said, Chinchilla directly translated into English means “little Chincha. Chinchillas, being an endangered species, currently only has two species still alive. These include the Chinchilla Lanigera, which although rare is the only one still found in the wild, and the Chinchilla Brevicaudata which is pretty much extinct. Chinchilla Lanigera is the most common species that have been domesticated, while Chinchilla Lanigera is known to have shorter tails, smaller ears, thicker necks and wider shoulders. I’ll admit, I’m not too well-versed in what hypoallergenic really means, but Chinchillas are classified as a hypoallergenic pet since they produce very little dander. 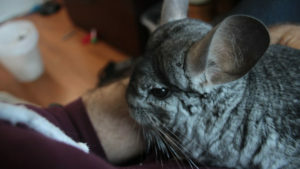 This is due to their thick coats, however, I do know one of my friends says that Chinchillas spark her allergies. 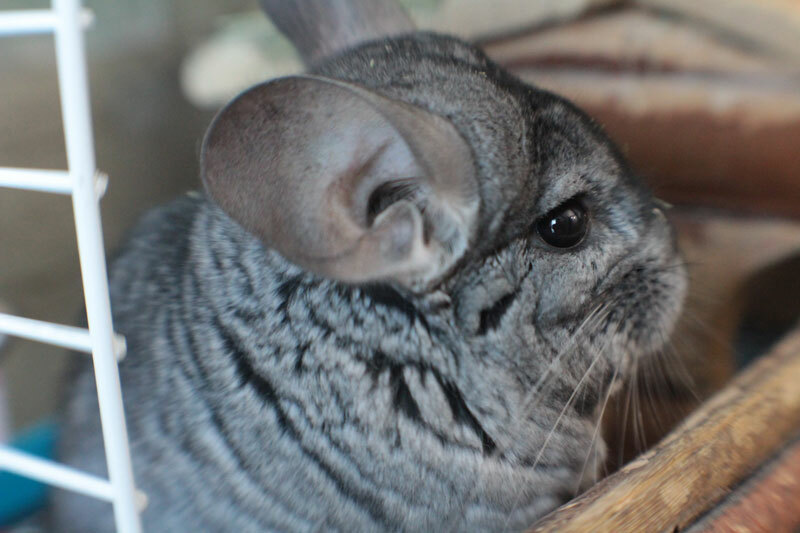 I have heard that a number of “hypoallergenic pets” still cause signs of allergies, however not as severe, so make sure you check into whether or not you’re allergic to Chinchillas before adopting one! Similar to the point above, Chinchillas don’t usually get bothered by fleas and other forms of parasites. This is due to the fact that the parasites and fleas are unable to reach the Chinchillas skin due to their extremely thick coats. Being such small creatures, it’s easy to assume that Chinchillas are often dinner for other animals. When attacked Chinchillas will actually shed a part of their fur to escape. After doing this they will also commonly urinate on their attacker as a self-defence mechanism. 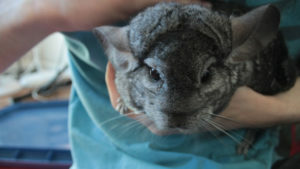 You may see signs of this if you are rough with your Chinchilla or if they are too scared. 11. Chinchillas Jump REALLY HIGH! Since Chinchillas are mountain creatures they have to be able to jump crazy distances. How high do you think they jump? Find out here! Although being small mammals, Chinchillas are actually much more affectionate than you’d think. As mentioned they do very well in packs or when they have cagemates, however, if you do not have a cagemate for your little one, you’re going to want to make sure you spend a lot of time with your Chinchilla friend. Chinchilla’s bond with humans fairly easily and often Chinchilla owners who have one Chinchilla find it difficult to give them all the attention that they need/want. 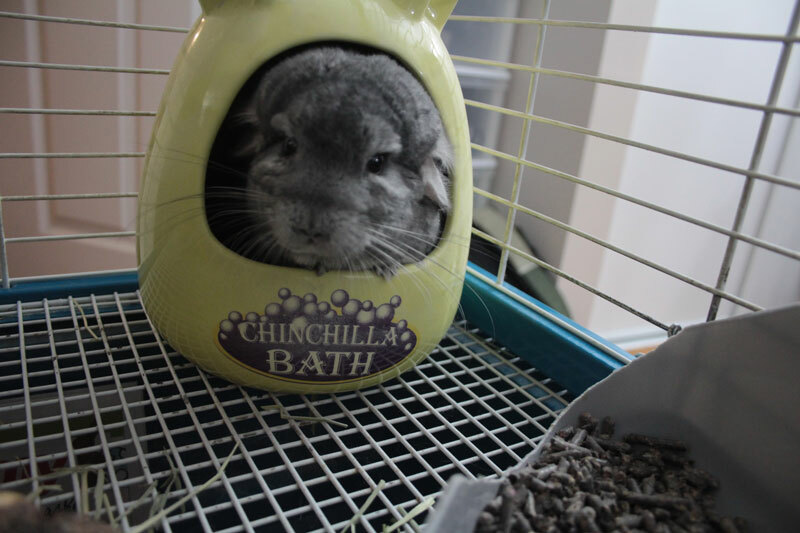 In the wild, Chinchillas actually bath in volcanic ash. Chinchillas shouldn’t have any water contact on their fur, but if you want to know more about that recommend you check out this article. 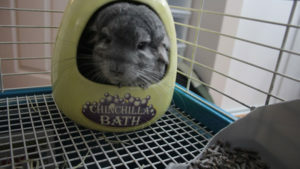 Photo from Do Chinchillas Need Dust Baths? Are They Necessary or Can I Skip Them? Just like a number of other small mammals a Chinchilla’s teeth never stop growing. This means they need a lot of things to chew on, like wood, toys, etc. If you need some tips of toys we love check out my post here. 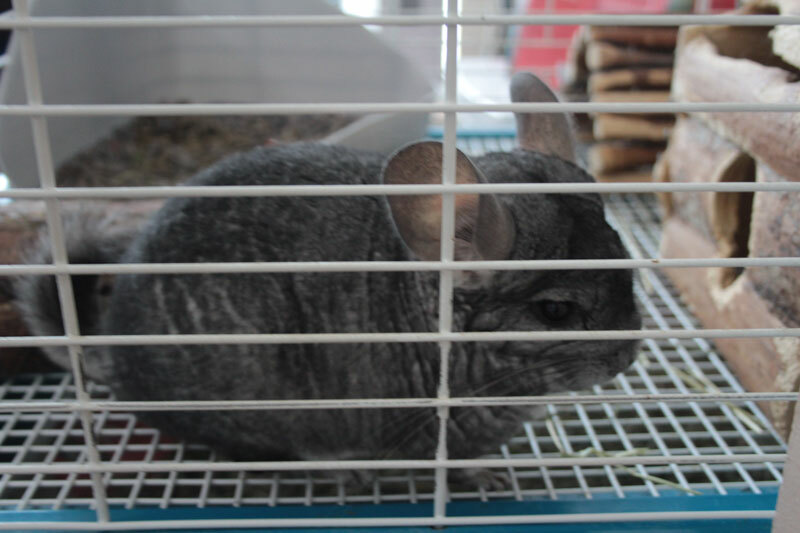 Chinchilla’s eyes, while big and round, are actually underdeveloped and can’t see very well. They actually use their whiskers to get around. Their whiskers can grow up to around half their body length. This was one of the first facts I learned about Chinchillas which actually terrified me. Being from high up in the mountains, Chinchillas don’t actually need the ability to sweat, so they have no way of doing it. Chinchillas who are exposed to temperatures higher than 80°F or 25°C may actually experience heatstroke. The only method Chinchillas have to reduce their body temperature is to pump blood into their ears. This makes it very easy to spot an overheating Chinchilla as their ears will be bright red. Do your best to ensure that your Chinchillas is kept in a cool room in your house or turn up the AC. Fans will not help cool down your Chinchilla as fans only cool us down because of our sweat. 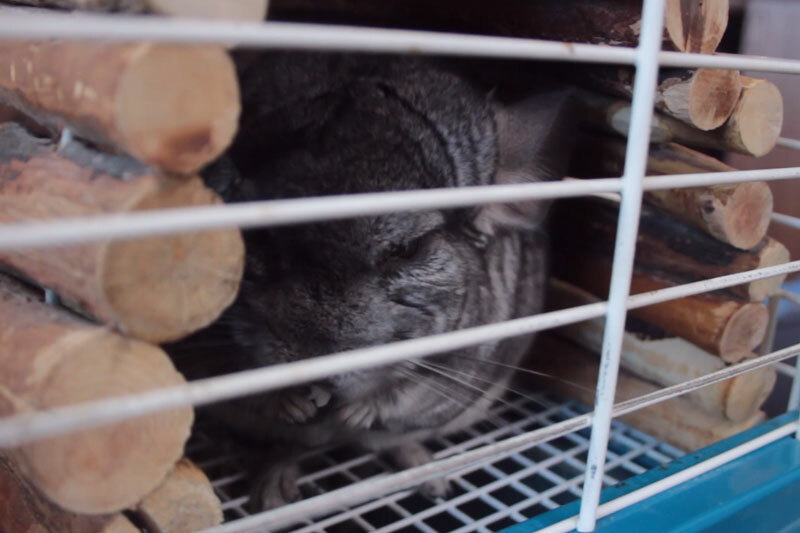 It can be fairly intense living with a Chinchilla as they produce some of the strangest noises known. Chinchillas have the ability to produce noises such as barks, squeals, chirps and grunts. It can be shocking to hear that Chinchillas don’t hear as well as other animals, however, the range of frequencies they can hear is similar to ours. So if you’re making or producing noises that are higher than you can hear, chances are your Chinchilla can’t hear them either. Bouncing off the point above, since Chinchillas can hear frequencies similar to us their cochlea is also around the same size as ours. 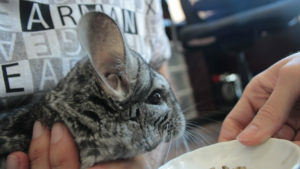 Because of this, many schools will actually use Chinchillas as examples or used as models to show the auditory system. On top of that, it’s a lot easier for you to access a Chinchilla’s cochlea versus a human, making them great models to use! Photo from What do Chinchillas Eat? 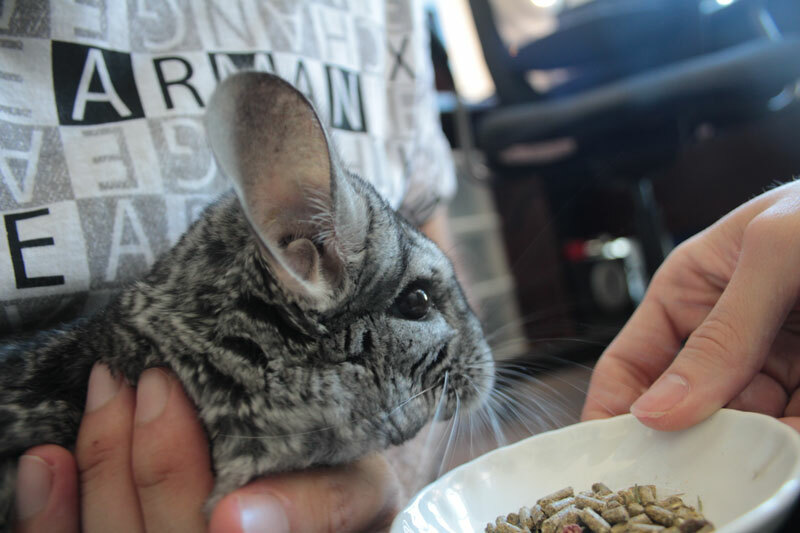 What Should I Feed My Chinchilla? I envy Gary often since he can curl up into any position and be happy. This trait comes from Chinchillas burrowing into any hole they see fit in the wild. So if you find your Chinchilla sleeping in an awkward or compromising position, don’t be scared! It’s totally normal and they’re just exercising a gift that evolution gave them! I wrote a longer article about what is an acceptable Chinchilla diet, however, it’s good to know that Chinchillas don’t actually need to eat much of it. This is due to the fact that their natural habitat doesn’t actually have a lot of food. Feeding Chinchilla’s things that are not natural to their diet may lead to an upset stomach or in extreme conditions, death. Similar to hamsters, Chinchillas also enjoy eating on their haunches (that being their back legs). Chinchillas like to hold their food and nibble on it. Trust me, it’s one of the cutest things and I’ll make sure to record a video as soon as I can! This can be a scary fact to know as a pet parent as Chinchillas don’t actually have a mating season. They are always ready to breed and have a much longer gestation period than most animals their size. The average Chinchilla’s gestation period is 111 days. The average Chinchilla has twins, however, they can have as little as 1 Kit or as many as 6 Kits. I found this to be one of the most interesting facts about Chinchillas. Chinchillas are actually born with a full body of fur and their eyes are fully-functional making them able to cope with the harsh weather conditions from birth. Could you imagine if we were born ready to face the world immediately? It actually shocked me how long Chinchillas actually live for as they can live up to 10x longer than the average small rodent. I’m not going to spoil how many years that is, but I would encourage you to check out my article about the lifespan of Chinchillas and how to make sure they live the longest they can! Photo from How Long Does a Chinchilla Live? How long is their Lifespan? This is a very sad fact to share with you, however, it’s my duty to inform you of the catastrophes of the fur industry. We are actually the reason why one of the species became extinct. It had nothing to do with evolution, it had nothing to do with the natural cycle of extinction, sadly this one is on our hands. Now, this doesn’t mean that all Chinchilla owners should surrender their little ones so they can repopulate the affected areas as pet Chinchillas have been domesticated and would not be able to survive the extremities of their natural environment, but it does mean we need to stop supporting industries which are causing them to become extinct. To put it into numbers there were only 42 Chinchilla colonies in 1996 and the numbers are steadily decreasing. Again, a bit of a gruesome fact, but just like the header says it takes A LOT of Chinchillas to make one jacket. While this I have to admit that their fur is extremely soft, I also have to say that 150 of these adorable creatures does not seem worth it for one jacket. I’m happy to state that it is illegal to hunt wild Chinchillas. While this is true, there is still a lot of illegal hunting happening. That being the case, scientists believe that the two species of Chinchillas may actually become extinct within our lifetime. According to the Merck Veterinary Manual, Chinchillas actually used to have mottled yellow-gray fur. Their fur has changed colours over the years due to selective breeding. Some of these colours include bluish-gray, white, black, silver, and beige. Although they come in such diverse colours, the tip of each hair will always end with black, no matter what colour they are! Interesting, eh? This is a really interesting fact to me. Female Chinchillas tend to be monogamous and will mate with the same male for the majority of their lives, although males commonly have many female mates. This is true especially of domesticated Chinchillas. It’s interesting to learn which gender is more dominant than the other, and commonly males are assumed to always be more dominant than females. This is not true when it comes to Chinchilla. Females tend to be aggressive towards other females and males, especially when it comes to mating time. Although many Chinchilla diets are vegetarian, Chinchillas are actually omnivores. While having a predominantly vegetarian diet, they do eat small insects and bird eggs every so often. This was a fact that kind of shocked me, but apparently, Chinchillas are considered smarter than rabbits because they are easier to train. Chinchillas can also actively be played with similar to cats, which makes me want to research the different tricks and games Chinchillas can learn to do/play! Similar to rabbits and other small mammals, Chinchillas will re-eat their dropping to make sure that they have gotten all of the nutritional value they need from their food. So pet parents and pet lovers, were there any facts on this list that you didn’t know about? What was the most interesting or shocking to you? Honestly, Chinchillas are pretty cool little buggers and I’m glad that we adopted Gary. He’s definitely sparked my hunger for knowledge! Very interesting. I knew none of this. How sad that they are used for coats though. Some really cool facts, eh? And yes, it’s pretty sad. especially given how many we have left.